Whether you're thinking of going vegan or just want to eat more healthy, meatless meals each week, there are a wealth of vegan cookbooks out there to inspire and advise you. I should know, I think I own just about all of them! Here are 5 very different cookbooks, all of them vegan and each of them with their own cooking (or not cooking) styles. This one is right up my alley. Because a vegan diet doesn't necessarily mean giving up all sweets, fats and goodies, there's Vegan Junk Food: 225 Sinful Snacks that are Good for the Soul . One day my daughter wanted to make a dessert of some kind. I opened up this cookbook from my position on the couch and called out to her with the ingredients and instructions for Chocolate Chunk Brownies. The ingredients are deceptively simple, as is the process for making these luscious brownies. I was more-than-pleasantly surprised to find that the brownies were fudgey and delicious. In fact I had long been searching for the perfect vegan brownie recipe and now I've finally found it! I just have to list some of the recipe titles to give you an idea of how tempting these recipes are: Baked Donut Holes 3-Ways, Tater Tot Breakfast Casserole, Chickpea Tuna Melt, Beer Cheese Bread, Chocolate Mint Cookie Layer Cake...I could go on, but you get the idea. This is vegan comfort food at its best. Cookbook author Lane Gold is a personal chef and caterer in Los Angeles, California. She specializes in homestyle vegan food. 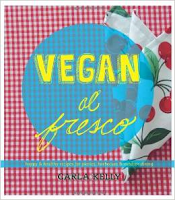 Vegan al Fresco: Happy & Healthy Recipes for Picnics, Barbecues & Outdoor Dining . Just the name alone. I mean, I plan to squeeze every bit of enjoyment out of this summer. The winter was soooo long, and guess what? It rolls around again after fall. So now is the time to hang out on the deck with an iced tea, gather around the fire pit with friends and eat all those incredible summer salads (and desserts!). 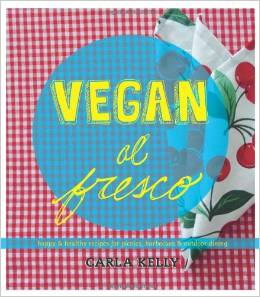 In Vegan al Fresco, Carla Kelly includes over 200 creative, healthy recipes for everything from salads to brunch to mains to desserts. She transforms basic sandwiches, burgers and veggies into elegant outdoor dining creations using homemade jams, sauces and dips. There are recipes for finger foods that are perfect for taking camping, on road trips and on hiking expeditions. 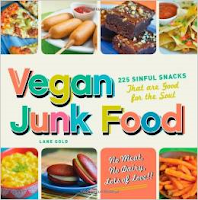 This book answers the question, "What vegan dish can I bring to a potluck picnic or barbecue?" Recipes that contain gluten, soy or nuts are clearly marked for those with allergies or sensitivities. Carla is also the author of Quick and Easy Vegan Slow Cooking and Quick & Easy Vegan Bake Sale . Her ideal al fresco dining experience is dining in the evening on her patio with her immediate family. Her go-to dish for dazzling party guests is Berry Swirl Cheesecake topped with more fresh berries. 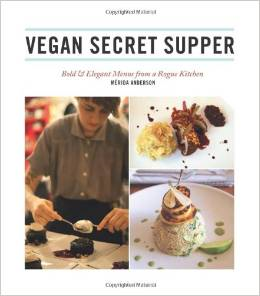 On the fancier side of things, you can make impressive dishes to wow dinner guests with using the recipes in Vegan Secret Supper: Bold & Elegant Menus from a Rogue Kitchen . I confess I encouraged my husband to look through this cookbook, hoping he would want to make a dish or two. This lovely book is by chef Mérida Anderson of dining club VSS (Vegan Secret Supper), which has hosted modern, multi-course, plant-based meals in Vancouver, Montreal and New York. Now we can make Mérida's sophisticated, animal-free meals at home. The recipes are well-suited to a beautiful dinner party with friends or even a romantic meal for two. Leek & Oyster Mushroom Risotto Cakes With Yellow Beet Reduction anyone? By the looks of the lovely photographs, these gourmet recipes are worthy of the time and care you'll put into them. Let's take the Pipian Pesto Tortellini With Seared Asparagus & Roasted Tomatillo Sauce. Mérida makes fresh tortellini using vegan wonton wrappers and a filling that includes shallots, pumpkin seed butter, lemon juice and more. Topped with the seared asparagus and fresh tomatillo sauce, it's an entrée worthy of the most picky guest. Follow it up with White Chocolate Cashew Mousse With Date Caramel & Cardamom. Vegan Secret Supper proves that vegan food can be chef- and foodie-worthy. Oh, and there's a whole chapter on vegan ice creams too! Visit Mérida at vegansecretsupper.com. Any well-rounded vegan cookbook collection must include one or two raw recipe books. Especially in summer, because how often do you want to turn on that oven? Rawesomely Vegan! : The Ultimate Raw Vegan Recipe Book has more than 300 raw foods recipes to help you create fresh, mouthwatering, healthy meals and snacks. Food is never heated above 118 degrees Fahrenheit so your body has access to important enzymes and easily assimilated nutrients, beneficial bacteria and unaltered proteins. 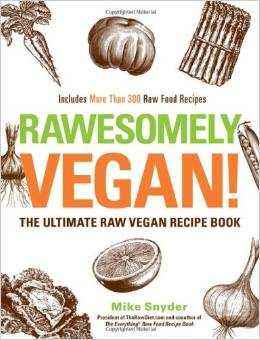 By Mike Snyder of TheRawDiet.com, Rawesomely Vegan starts with chapters on stocking your raw kitchen, raw kitchen equipment and helpful tips on following a raw diet. 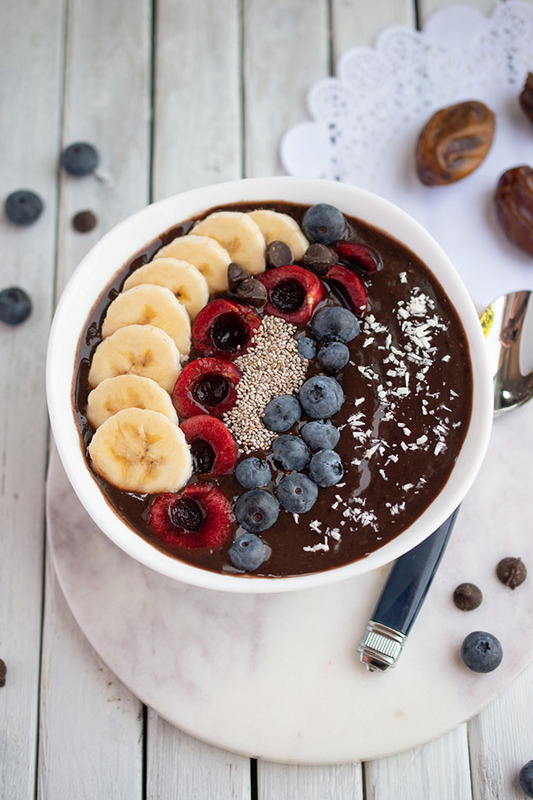 Then it's on to the recipes - with lots of juices and smoothies to help you achieve better health, breakfast granolas, puddings, oatmeals and yogurts to make from scratch, creative salads, soups for all seasons, dips, sandwiches, main events, crackers, breads, drinks and desserts. Everything sounds absolutely delicious and entirely healthful. There are photographs in the centre of the book, offering a look at tempting creations such as Silver Dollar Strawberry Pancakes with Unreal Maple Syrup, Secret Success Zucchini Hummus with Good Earth Crackers and Mega Maca Burger Patties on Onion Bread or Buns with Sweet Tater French Drys. There is plenty here to inspire everybody from a seasoned raw foodist to a newbie just hoping to take steps towards a healthier lifestyle. 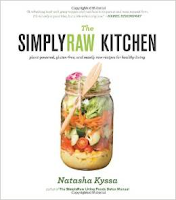 With both raw and cooked options, The SimplyRaw Kitchen: Plant-Powered, Gluten-Free, and Mostly Raw Recipes for Healthy Living promotes a balanced, flexible diet based on fresh plant foods. 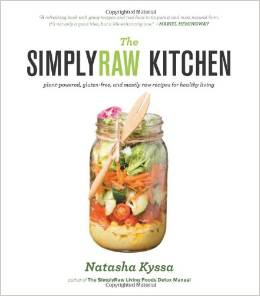 Written by Natasha Kyssa, who runs SimplyRaw Express, a vegan restaurant in Ottawa, The SimplyRaw Kitchen also includes recipes from Natasha's mother, who brings an Eastern European sensibility to healthy cooking. 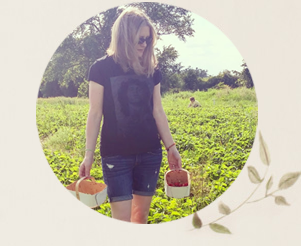 As a healthy lifestyle consultant, Natasha has seen the same foundational improvements in most of her clients who have incorporated more fresh foods into their diets: increased energy, improved digestion, better sleep, glowing skin, balanced moods and an overall improved mental, physical and emotional state. If Natasha could get you to do only one thing to improve your wellness, she would suggest that you keep your mornings raw - eat fresh, whole plant foods, such as a green juice or smoothie. Start your day with a juice like the Inflammation Buster, a combo of pineapple, ginger, cilantro, lime and jalapeno pepper. Lunch on Popeye Soup, a blend of apples, spinach, celery and more. Or how about Garden Salad in a Jar, with chopped cauliflower, shredded carrots and sprouted chickpeas? Dinner might be Pasta Primavera with zucchini noodles. Enjoy a sweet treat of Date Me Squares. All the recipes sound completely refreshing and delicious. 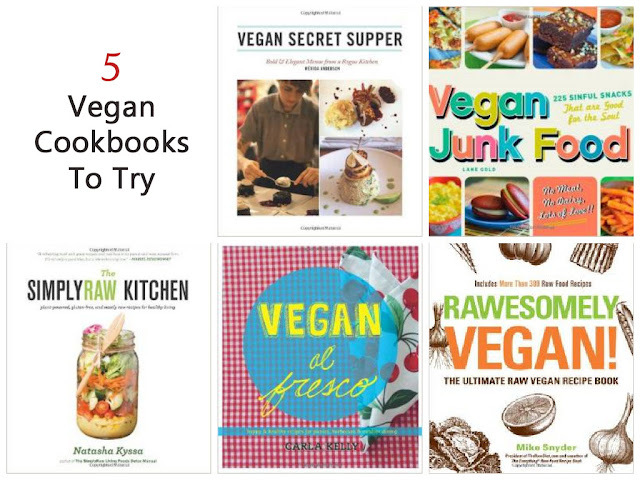 Which of these vegan cookbooks would you like to add to your collection? *This post contains affiliate links. If you end up buying something via my link I may get a very tiny amount of money from Amazon.